1. Make a list of the people you’d like to invite to your event, with their email addresses. 2. 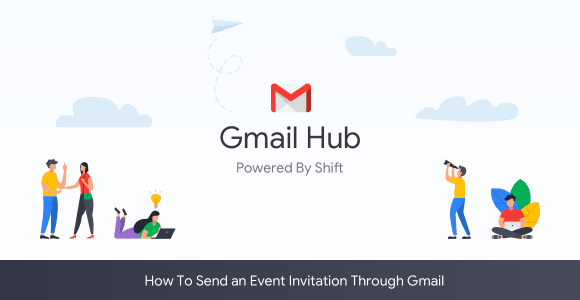 Open your Shift app, click the Gmail account you want to send the invitations from and open Google Calendar. 3. Create an event by pressing the red ‘plus’ sign on the bottom right corner. 4. Locate the ‘add guests’ search bar on the right. 5. Type in the names of people you’d like to invite from your Google contact list. You can also enter email addresses of people who aren’t on your Google contact list. 6. Click “save.” Your email invitations will be automatically sent when you save your changes. You can invite up to 200 people using this method. If you would like to invite more people, you can use Google Groups and invite up to 100,000 guests. Note: Your guests do not have to be active on Google Calendar or have a Gmail account. You only need to know their current email address to invite them to your event. When your friends receive the invitation to your event, they have the option to click on ‘yes,’ ‘no’ or ‘maybe’ from links within the email. To track responses, click on the event within Google Calendar to see who clicked which option.